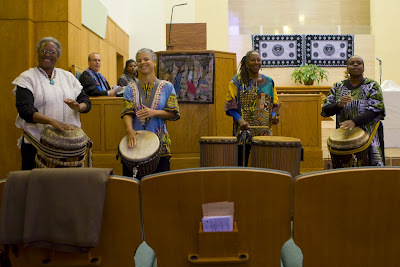 This past Sunday, October 4, Sistahs of the Drum were an integral part of the music ministry at Lakeshore Avenue Baptist Church. Missing in action were Mar Stevens and Sandy Mills (celebrating family bdays). 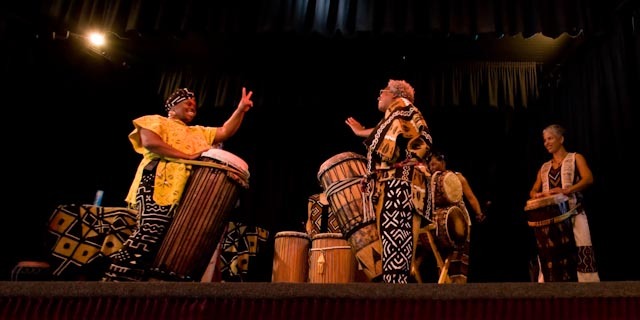 Simbwala, Rosetta, Zenju Earthlyn and I represented for the group and carried the rhythms that have been passed on to us through our various teachers. We all agreed that this was a mutually beneficial sharing of our time and talent. We were exceptionally well received by the parishioners (they even stood up and danced during the last song) and we appreciated experiencing the way Lakeshore Avenue Baptist worships. The church body is very diverse (a great representation of the neighborhood it sits in), very receptive and warm. The building itself has amazing acoustics. From the moment we walked in it was clear that this was a good fit for us. We knew going in that our intention was to be in ritual and not performance. The energy of the service is very laid back and subtle...no antics. The energy we drummed with was powerful, but not overpowering. Intention realized.